SPECIFICATION INCLUDES:- SMG DRIVELOGIC M-TRANSMISSION, PAINTED FACTORY HARD TOP, METALLIC PAINT, PROFESSIONAL SATELLITE NAVIGATION AND TV MODULE, 6-DISC CD CHANGER, CLIMATE CONTROL, XENON HEADLAMPS WITH HEADLIGHT CLEANING SYSTEM, M-SPORT MULTI-FUNCTION LEATHER STEERING WHEEL, RAIN SENSOR, DYNAMIC STABILITY CONTROL, HEATED SPORTS SEATS, PARK ASSIST, CRUISE CONTROL, ELECTRIC SEATS WITH DRIVER MEMORY, ELECTRIC FOLDING MIRRORS, ELECTRICALLY-OPERATED BLACK SOFT TOP, ELECTRIC WINDOWS, REMOTE CENTRAL LOCKING, 18” ALLOY WHEELS. TRACKER ALSO FITTED. 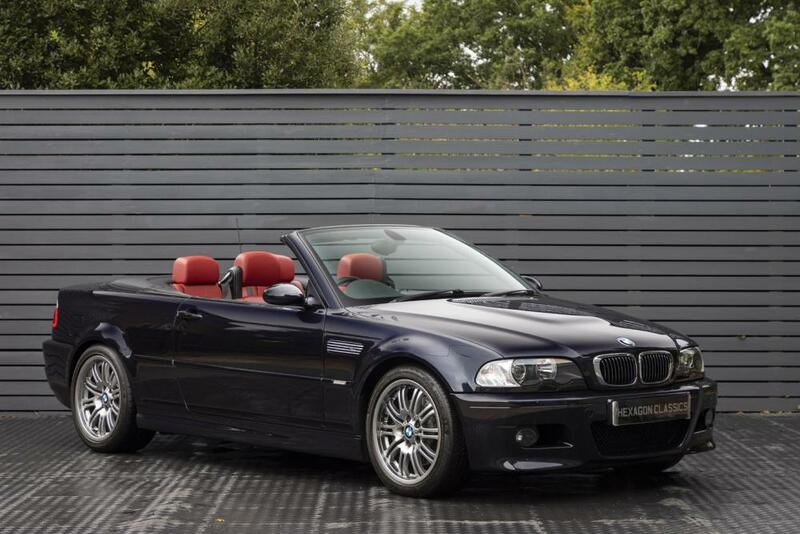 Hexagon Classics are delighted to offer the ever-popular M3 E46 Convertible, in a desirable colour combination with an ultra-low mileage. These M3s are now very much the modern sports classic to watch. The BMW M3 is a high-performance version of the BMW 3 Series, developed by BMW’s in-house motorsport division, BMW M GmbH. Improvements over the regular 3 Series cars include more powerful and responsive engines, improved handling/suspension/braking systems, aerodynamic body enhancements, lightweight components, and interior/exterior accents with the tri-colour “M” (Motorsport) emblem. The E46 M3, was first introduced in October 2000, with the new 3,246 cc S54 M-tuned engine. It was only available in coupe and convertible body forms. The E46 M3 optionally came with a SMG Drivelogic transmission, (also known as the SMG II). This is the standard 6-speed Getrag transmission with an electro-hydraulically actuated clutch (no clutch pedal). Shifts are made via the SMG gear knob or the steering wheel mounted paddle shifters. The engine had a redline of 8,000 rpm. As with most M engines, the S54 again had 6 independent throttle bodies and this time electronically operated throttles, (drive-by-wire throttle with no cable). Supplied new by Peter Vardy BMW in September 2003, our M3 has had just 2 private keepers, and boasts a full BMW service history. (8 BMW main dealer stamps). It will be supplied with a 12-month written warranty.